I have actually had this one on my "want to make" list for a couple of months, but just did not get around to it until this past weekend. If you like peaches, you will love this recipe. This is my favorite fruit of summertime, so I was perfectly happy to stick with it, but if you aren't a fan of peaches, pineapple would be a perfect substitute here. The sauce is the best thing ever adding such a rich flavor to the peaches. And over vanilla ice cream?? Ah, truly scrumptious. 1. Combine butter, brown sugar, rum, cinnamon, & salt in a saucepan on medium-high heat. Melt the ingredients, stirring often, until a syrup forms. 2. Slice the peaches into quarters and discard the pit. Dunk the peaches into the sauce and place them on the grill. Once you have nice grill marks, flip them over. 3. When both sides are done, place the slices over ice cream. Spoon the sauce over the ice cream and peaches and serve immediately. The first post I want to share is from Come Home For Comfort. I discovered this blog a little over a year ago and loved it immediately. As a homebody, just the name of the blog drew me in. :) She has great posts every week. My favorites are her marriage Monday posts & her grocery haul/meal plan posts. This past week,she had a post about why she serves meals at the table. The post was perfect! I was raised in a family that ate together at the table every night (except for an occasional pizza movie night) & I really value/appreciate being raised to do that. I know so many people who can't remember the last time they sat at the table with their siblings and parents for a meal and I think that's so sad! My husband loves eating on the sofa because of the 'comfiness', so we eat about 2 meals a week there. But we try to have most of our meals at the table. Our conversations are so much better at the table and we linger and take out time enjoying the food instead of inhaling it mindlessly like we do on the sofa. Honestly, I think it's good for our marriage, and one day our family, to have that time together at the meal table. Anyway, go check out Whitney's post! The second post I want to share is from the Brown Eyed Baker. She had a baking basics post that I found helpful. I was not aware of the difference in #3 & I had never taken the time to check my oven's temp accuracy as mentioned in #4. Go read it for some quick tips! They have a lot of good posts for both the new wife and the seasoned wife. I have a really quick, easy recipe to share today - baked oatmeal muffins. These are perfect for a quick breakfast, mid-afternoon snack, or a pre-workout snack. I had seen recipes like this floating around Pinterest and so about a month ago, I decided to try one of my own. :) They only take 5 minutes to put together and 20 minutes to cook! Preheat oven to 425. Spray a muffin tin with cooking spray. Combine all ingredients in a large bowl. Scoop equal amounts of the mixture into prepared muffin tin. Bake at 425 for 5 minutes; then bake at 375 for 15 minutes. Let baked oatmeal cool for 5 minutes, then transfer to a cooling rack. Eat once cool or refrigerate up to a week. It's finally Friday! :) Today I wanted to share a kitchen haul with you all. I went to BB&B a couple of weeks ago and picked up a few items I had been wanting/needing for a while. The best part was that it was all free! I had a gift card from my birthday last year and a gift card I found leftover from our wedding almost 2 years ago that still had $20 on it! I made my list and headed to the store for my items. I was determined to not use any spending money on this trip (I can get a little carried away in BB&B ;) ) and had actually put several more items in my cart but had to remove them and wait for a later time. It's crazy how fast everything adds up! If I had not had any gift cards, the items below would have come to about $65. Is it just me or is that crazy?? Obviously, I was very grateful to have the gift cards and also very pleased with the items I purchased. Read on to see what I bought . . . The first item on my list was a soap dispenser for my kitchen. We had a sad little Softsoap brand soap bottle that we had used for the past two years and needless to say, it was pretty gross and just generally unattractive with all of the writing on the front of it. We chose a cute little mason jar soap dispenser to replace it and I love it! So much better. The 'before' . . .
For those of you who don't know this, I'm a somewhat picky person. Particularly when it comes to kitchen dishes. When I got married, I did not put any serving plates or bowls on my registry because those are the sort of things I like to see and feel in person before deciding if I like them enough. I don't know why I'm so picky with serving dishes, but I am. So, I don't have very many serving dishes but I want to start purchasing some so that when I have company over, there are pretty dishes to serve food in, not just pots and pans. :) This platter is perfect for so many things - a pork loin, cookies, bruschetta, bread, appetizers, etc. For my sink area, I bought a sponge holder and a dish rack. I previously had a sponge holder with suction cups to stick to the side of the sink, but they became unstick-able after a ridiculously short amount of time, so I opted for this style now. I'm very pleased with it. It's small so the sink area doesn't look too cluttered, but it still holds all the sponges/scrapers that I use regularly. Sorry, there's no 'before' photo of the sink area - probably a good thing! I have a super chocolatey, fudgy, sweet, and scrumptious pie recipe to share today. (Was that descriptive enough? ;) ) You might have already seen this pie on my Facebook page; I made it for pi(e) day last week! This crust turned out infinitely better than the one last week . . . the difference in a store bought crust versus a homemade crust is quite obvious! But enough of that, back to the pie! I have a few photos here to share with you all and the video is below. If you scroll down past the video, I have the recipe typed out as usual. I hope you enjoy and will give this recipe a try! 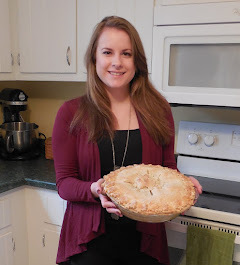 It is so easy to make - if you are a new pie baker, I highly recommend this recipe as a place to start. :) To save this recipe for later, there is a Pinterest button at the bottom of the post near the comments section. 1. Lightly spray an 8-inch pie plate with non-stick cooking spray. Fit pie crust into plate & set aside. 2. Melt butter and chocolate together in a small saucepan over very low heat, stirring frequently. Remove from heat and immediately add the sugar; stir until well combined. Allow to stand 3 minutes to cool slightly. 3. Place eggs in a mixing bowl & beat lightly with a fork or whisk. Add chocolate mixture and whisk until well combined. 4. Bake at 350 degrees on the bottom oven rack for 30 minutes. Move to top oven rack and bake for 10 minutes more. Cool to room temperature. 5. Serve with a dollop of whipped cream or a scoop of ice cream, if desired. The amazing, quick crust recipe I used for this pizza comes from Divas Can Cook. I discovered her YouTube channel a few months ago and y'all, she has so many mouthwatering recipes. I also love her personality - her videos are so fun to watch. I will have the crust recipe typed out below, but will also leave a link to the printable recipe she used. 1. In a small bowl, add 1 tsp. sugar to very warm water. Stir in yeast and allow to sit for 10-15 minutes to allow yeast to proof. When yeast is ready, add the mixture to a large bowl. 2. Stir in flour, salt, remaining sugar, oil, Italian seasoning, and Parmesan cheese. When dough forms, place on a lightly floured surface and knead gently with oiled hands. 3. Press the dough into a lightly greased 12-inch pizza pan. Keep your hands oiled to soften the dough and make it easier to press out. Cover with plastic wrap and place in a warm location for 10 - 30 minutes (30 minutes for a fluffier crust). 4. Preheat oven to 425. Top with sauce and toppings. Bake for 12 minutes or until the crust in the center of the pizza is fluffy and fully cooked. 1. Place the cooked, shredded chicken breast in a bowl & add 3/4 a cup of bbq sauce. Stir to combine. 2. Finely chop red onions & parsley and set aside. Shred mozzarella cheese; set aside. 3. Spread remaining 3/4 cups of bbq sauce over prepared pizza crust. Sprinkle with cheese (the more, the better ;) ). Top with bbq chicken, red onions, & Italian seasoning. 4. In a small bowl, combine butter, oil, Parmesan cheese, and garlic powder. Brush on edges of crust. Be generous. 5. Bake for 12 minutes or until crust is fully cooked and fluffy - bottom will be slightly browned & crisp. *You can totally substitute canned chicken here and make it even quicker! ***I also like to use Penzey's Frozen Pizza Seasoning sometimes in place of the Italian seasoning. This icing is luscious. That's the only word I have for it. I'm not even a huge icing fan, but this stuff is luscious. Of course, considering that it includes Nutella, sour cream, and melted dark chocolate, it's no wonder this is sooo good. Start by taking a dollop of the icing and spreading it on the center of a cake board. This will 'glue' the cake to the board so that it doesn't shift. First cake layer gets iced. Second cake layer loaded up! Once you place the third cake layer on, ice the top and sides of the cake. wrap in plastic wrap, & refrigerate for 15 minutes. This is the crumb coat & refrigerating it seals the crumbs in so that the rest of the icing goes on flawless. Decorate the cake however you'd like. I used a star tip to decorate the edge of the top layer. I almost left if just like this because to me it already looked pretty enough :), but . . .
. . .then I decided to use some cake crumbs that were stuck to the parchment paper (the cake bottom I lost mentioned in last post, hehe) to sprinkle on the top. This cake is super moist, so the crumbs were clumpier than I envisioned them on top, but I still liked the contrast it added. Ahhh, look at that. Is there anything more beautiful? Put all of the ingredients in a food processor, and pulse until smooth & glossy, about 1 minute. The frosting will be very soft. Refrigerate until it thickens slightly, about 15 minutes. Put a dollop of frosting on a cake board. Place your first layer on the plate & spread 1 cup of frosting evenly across layer. Repeat with second layer. Put the final cake layer top-down. Cover the layers with plastic wrap and wiggle into place. Refrigerate for 30 minutes. Frost entire outside of cake with a thin layer of frosting to seal in the crumbs. Chill until the frosting begins to firm, about 15 minutes. Repeat with another thin layer of frosting, this time working to achieve smoothness. Chill for an additional 15 minutes. Chill until the frosting firms up again, about 30 minutes. The cake will keep refrigerated up to 3 days. Just a simple girl who has an unabashed love for food. Comfort food, desserts, gourmet dishes - it's all here. I invite you to join me in my contemplations, discoveries, and ramblings as I work with "that old oven".